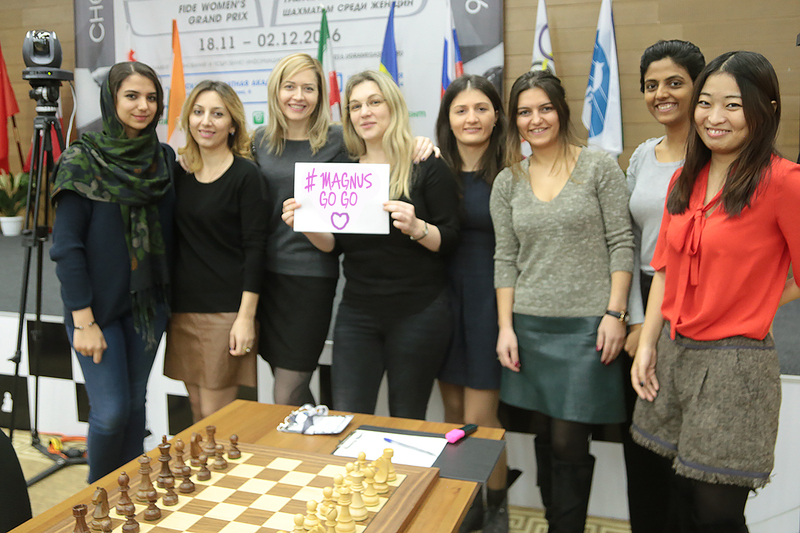 Tina Kandelaki, CEO of the Russian sports channel Match TV, initiated a flashmob yesterday, supporting Sergey Karjakin in the World Championship match. “He needs our support more than ever”, wrote the TV celebrity on her Facebook page. The participants of the FIDE Grand Prix reacted to her words, but in a rather unexpected way. Before the start of the 7th round something special was clearly brewing. As soon as the players noticed a photographer, they started waving energetically: come here! come here! Sasha Kosteniuk was already writing the suggested hashtag – “Go Karjakin”! The four Russians – Kosteniuk, Gunina, Girya, and Pogonina – stood next to each other and lifted up the poster. “Make sure the chess board is in the frame”, said Kosteniuk, reminding the flashmob requirements. The girls posed for about 20 seconds and then returned to the tables with quite happy looks. Kosteinuk and Gunina even high-fived each other. “Who decided to join the flashmob?”, asked one of the journalists at the press-conference. “The idea appeared sort of on its own as we were driving from the hotel”, said Kosteniuk. “I hope our support helps Sergey winning the match”. However, this was only a half of the show. 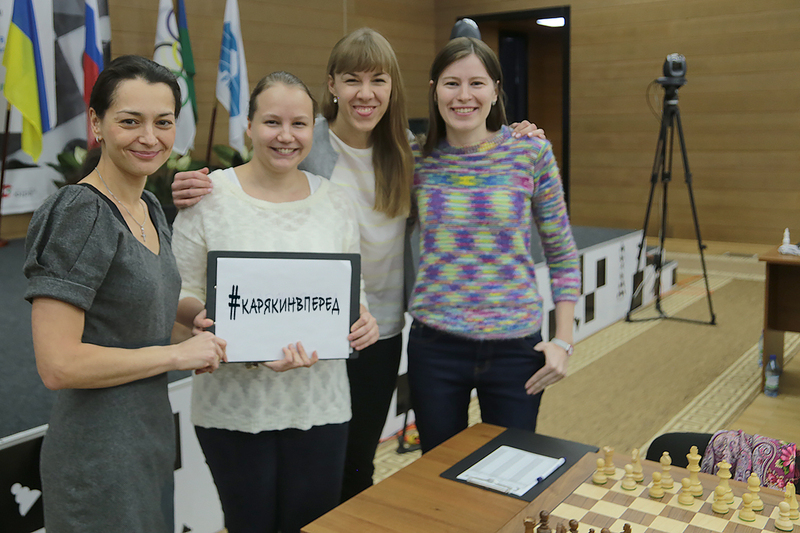 While the Russians were expressing their support to Karjakin, the players from other countries formed a Magnus Carlsen’s fan club. Almira Skripchenko grabbed a pink tip marker and started working on the response. After some thought she finally wrote “#Magnus GoGo”, and then, upon receiving an advice from her friends, added a frisky-looking heart. Then the girls, barely holding their laughter, posed together with the poster, and Bela Khotenashvili added the winning gesture. We are not exactly sure this photo will be shown on Match TV. So, the participants of the Grand Prix divided their votes as 8 to 4 in Carlsen’s favor. However, it will probably not affect the relationship between the girls. This is just a matter of taste!